We tend to get really crabby when the crab cake we ordered with great gustatory anticipation turns out to be mostly breadcrumb filler and tasteless stringy crabmeat. So Grommet went on the prowl and located the most spectacular crab cakes of all—Angelina’s of Maryland award-winning crab cakes. It’s a pretty well-kept secret that most crabmeat in this country comes from Asia, EXCEPT the true blue lump crabmeat from the Chesapeake Bay where Angelina Tadduni (pictured at right) once owned a popular Italian restaurant with her husband for many years. Though the couple passed on, and the restaurant is no longer, Angelina’s famous mouthwatering lump crab cakes can be yours for the asking. New owners DJ, Chad, and Joseph do a booming mail order business year round—with just these succulent cakes—that we think any father, grandfather, uncle or husband would love to receive as a father’s day gift. The timing couldn’t be better either, June is the height of crab season in the Bay. Dig in! Angelina’s of Maryland is all about tradition - the tradition of a little family restaurant in Baltimore and the big reputation they earned for making the finest crab cakes around. Today our crab cakes are made by hand on Maryland ’s Eastern Shore, and we still insist on 100% domestic blue crab from the Chesapeake Bay and surrounding areas. In an age dominated by low-cost imported substitutes, this is now a rare delight for seafood lovers coast to coast. We keep our standards so high to honor the tradition we inherited. Miss Angelina stayed in the kitchen until she was 84 years old to make sure things were done right – and we wouldn’t dare disappoint her or her legacy! I look forward to reading your comments and answering any questions you have about Angelina’s Crab Cakes. You're making me swoon! Everyone knows the only place to get great crab cakes is Maryland. Feel free to send me some! Yum! We lived in Baltimore YEARS ago; and our mouths still water at the thought of Md. crabcakes. Thanks, Grommet....good to know we can now get them so easily. I often order crab cakes and I'm always disappointed. Well, I tried these and they are nothing like anything I've ever had. They are incredible. They are in their own league. You will be very happy you ordered these. I married into a Baltimore crab loving family. I've been to crab houses and backyard crab fests. Every time we go, we bring a cooler to bring back the crab meat. We are talking about a religious experience here! I've never seen anything like this food specialty in any other part of the country. And, anywhere outside of Maryland that claims to serve crab cakes..... it is NOT the real thing! Great Grommet idea!! 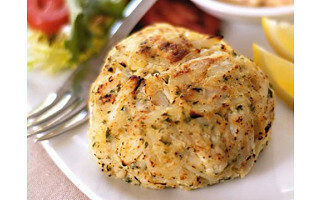 Baltimore crabcakes are the best, I have been making my own with CA Dungeness crab but they are not the same. Thanks for the tip! I can taste them already. What fun gifts for special friends. mmmm....crabcakes. My brother brings great crabmeat when he drives up north thru MD. angelina's crab cakes are the bomb diggity. you so wont regret biying them. and their soup is amazing tooo ! I was about to order the crab cakes, finished filling out all the "forms"; then was astounded to see that shipping would cost $43.00!!!!! Can they be ordered frozen with a more reasonable shipping cost? @glc.- On Friday's you have the option of ordering fresh crab, not frozen. I'm not sure where you live but if you're out west there is only one option to get those to you in good condition....Fed Ex Priority Overnight which costs a whopping $43.06. To most areas there are four shipping options and the crabs will arrive frozen. Fed Ex standard delivery to Massachusetts is $15.62. Hope this helps! That definitely sounds like an overnight shipping charge, which you would need as stated for a fresh delivery on Fridays. However there should always be a 2-Day option that is substantially less and would ship frozen (offered in a little drop-down box on the shopping cart page). And of course geography matters the most...we can get up to Maine, down to Georgia and out to Illinois for around $15 with FedEx Home Delivery / Ground. Unfortunately the airborne services really get up there as we go out west. I have eaten these and they are truly amazing. @PeterD's comment (about his brother bringing him crab when he drives through MD) makes me wish it was legal for Angelina's to ship to us the other thing that Maryland has -- 10 oz cans of beer. Whenever Chris at work visits his inlaws in MD, he's deluged with our requests for 10 oz beers. They would be perfect with this crab. Some of our best memories are of eating Maryland crabs and crabcakes in Chestertown, MD at the home of our amazing friends, the Christies. If you're looking for a great theme for a summer party, I encourage you to throw a "Crabfeast" and order these yummy crabcakes! There's really nothing like it. I hate to tell my New England lobster-lovin' friends, but crabs trump lobster in my book! Sounds delicious. Crabcakes are a big favorite of my husband's, especially with really good crabmeat. I didn't realize that most crabmeat we get is not from USA. 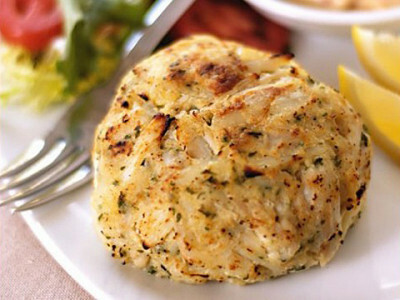 These are the best crabcakes ever! No fill, just chunks of sweet, juicy crab! Everyone should try these!!! Hi--that's me in the video. I was out for lunch today and looking at panini options in a cafe. There was a crabcake version. I'm in Boston so crabcakes are generally not bad. But there was no way I was going to order crabcake anyway. I have been TOTALLY spoiled by Angelina's. I really have never tasted their match anywhere. You're correct about the Angelina's Crab Cakes being the World's Best. The only correction that needs to be in your advertisement is that Bob Reilly was the Creator of this dish. I spent most of my life in Baltimore and I witnessed his creation first hand. He had numerous awards and even represented Baltimore in the Crab Olympics in San Francisco. This Crab Cake did not even exist at Angelina's until the late 60's. I'm not taking away anything from Mrs. Angelina, because she was a wonderful woman and I enjoyed numerous, delicious Italian dishes by her over the years. I just feel that credit should be given where credit is due. Hope this helped to clear it up. @Florida Firefighter: Thank you for giving us more insight into the evolution of the Maryland crab cake and giving Mr. Reilly his due as the original creator of this dish. We tend to get really crabby when the crab cake we ordered with great gustatory anticipation turns out to be mostly breadcrumb filler and tasteless stringy crabmeat. So Grommet went on the prowl and located the most spectacular crab cakes of all—Angelina’s of Maryland award-winning crab cakes. It’s a pretty well-kept secret that most crabmeat in this country comes from Asia, EXCEPT the true blue lump crabmeat from the Chesapeake Bay where Angelina Tadduni (pictured at right) once owned a popular Italian restaurant with her husband for many years. Though the couple passed on, and the restaurant is no longer, Angelina’s famous mouthwatering lump crab cakes can be yours for the asking.